Hiroshima’s subtropical climate makes summers in the city very hot and humid. The month of August is typically the warmest in the year, with temperatures averaging around 30C. Towards the end of World War 2, Hiroshima had a population of between 340,000 – 350,000. The city had so far been spared from the relentless firebombing by American warplanes that had devastated so many other Japanese cities, so people felt relatively safe there. The morning of August 6, 1945, was no different to any other. The day had dawned with intense summer heat. People were commuting to work and going about their daily lives oblivious to the impending hell that was about to be unleashed from above. Earlier that morning, three B29 bomber aircraft named Enola Gay, The Great Artiste, and a third, nameless aircraft later called Necessary Evil, had departed North Field in Tinian, bound for the islands of Japan, about six hours flight time away, on a bombing mission. However, this was no routine mission. During pre-flight briefing, three targets had been discussed; Hiroshima was the primary target, with Kokura and Nagasaki designated as alternatives for total obliteration. Enola Gay, flown by Colonel Paul W. Tibbets, had been chosen as the weapon delivery aircraft. Thus, substantial modifications had been done to it, to allow it to carry and safely deliver nuclear ordnance. On that fateful flight, Enola Gay carried a very special weapon; Little Boy, a bomb containing about 64kg of uranium-235. The fate of Hiroshima was thus sealed. Arming procedures for Little Boy were carried out mid-flight by Captain William S. Parsons. The weapon was armed only after Enola Gay was airborne, due to fears of a possible nuclear blast if the plane crashed during the take-off run. The last safety devices were removed 30 minutes before reaching the target city of Hiroshima. Little Boy, the world’s deadliest weapon, was now primed to deliver hell on Earth. In the city below, 21 year old Eiko Taoka and her one year old son were travelling onboard a streetcar that had left Hiroshima Station just after 8am. The streetcar trundled slowly on its tracks, so Eiko had time to observe the city’s surroundings in the moments before the bomb detonated. Enola Gay reached the target area and commenced its bomb run exactly at 8:09am. The B29 flew straight and level, aiming for the Aioi Bridge. Little Boy was released from its moorings at 8:15am. Due to unexpected crosswinds, it missed the aiming point by about 800ft, detonating instead 1,900ft directly above the Shima Surgical Clinic. Eiko was swapping seats with another passenger when a flash of blinding light turned the world into a white hot kill zone. A thunderous roar followed. The streetcar was about 750mts from ground zero. As the huge blast hit it, the streetcar caught fire. Conservative estimations put the death toll directly related to the initial blast at 80,000, dead in an instant. Vanished from existence, consumed by the nuclear fire. Above, Enola Gay, having delivered its deadly cargo, turned sharply and headed home. It left behind a hitherto unknown level of devastation. 4.7sq.mi were flattened, with about 70pc of all Hiroshima buildings completely destroyed. As a gigantic mushroom cloud soared high above the stricken city, Eiko and her young son found themselves outside the burning streetcar. The child was badly hurt. Shards of glass had etched into his head, and the wounds were bleeding profusely. There was chaos all around. The dead, wounded, and walking dead wandered aimlessly in the midst of hell. Nobody knew what had happened. Eiko looked at her son. Though wounded, he smiled, unable to comprehend the drama unfolding all around him. Eiko would later breastfeed him. The child died of radiation sickness 22 days later. The Hiroshima bombing marked a grim milestone in mankind’s history as the first time a nuclear weapon was dropped on a nation of the world. 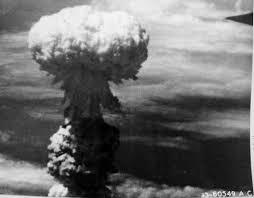 Nagasaki would soon become number two on that sinister list, and to date, no further nuclear attacks have taken place. The total number of casualties is almost impossible to ascertain, due to the amount of people who just disintegrated in the blast or burned to a cinder in the raging firestorms that followed the initial detonation. A general consensus exists that about 200,000 people perished as a direct result of the nuclear attacks on Hiroshima and Nagasaki, but many more would suffer and die in the years and decades that followed due to long term radiation effects. Today, both Hiroshima and Nagasaki are prosperous cities that were literally reborn out of their very ashes. Posted on August 4, 2015 by d4hakkaPosted in My life as a journalistTagged hell, hiroshima, little boy.